Yesterday we did the first half of what happens after you sell your novel, which got us up to galley proofs. Let's pick up there. Galley proofs can be anything from the final layout (the look of the printed book) on regular copy paper clipped together, or Advanced Reader Copies or ARCs. ARCs can be anything from a simple bound book with a plain cover, to looking like a trade paperback with real cover art and everything. My galley for The Shifter turned out to be a gorgeous ARC that looked like a trade paperback novel. I got a box of them and started screaming, way excited to be holding MY book in MY hands. It was actually more exciting to get the ARCs than the actual printed book since it was the first time I ever saw it in book form. ARCs/galleys are unproofed copies sent out to reviewers and industry folks to get advanced reviews and help sell the book to libraries and book stores. Everyone knows the typos will be fixed and tiny things may change. You might still be polishing or doing copy edits at this point, but you're pretty close to being done. If you have changes (and can still make them) at this point, you send them in. The Shifter and Darkfall ARC was/is pretty clean, while the Blue Fire ARC went through a lot more editing between ARC and final. Nothing in terms of the story or plot, just copy editing and general tightening. Once your publisher has ARCs, they'll start selling the book into bookstores and libraries. This is what will determine your future press run (how many books are printed), as the stores place orders. The ARCs may also be presented/displayed/given away at various industry conferences to build buzz and generate orders. About three months prior to launch, the final print count is set, the book jacket goes off to the printer (if it's a hardcover) and the cover is released to online stores like Amazon and Barnes & Noble.com. This is when you'll start seeing it when you Google yourself, which is a HUGE thrill. A few weeks after this, books are printed and delivered to the publisher's warehouse to be prepped for shipping to the retailers. You'll probably get a few copies around this time as well, with a sweet note from your editor. After you're done screaming and dancing for joy, read your book to make sure there aren't any horrific typos or mistakes. My agent has a horror story about this, though it's rare when things like that happen. A month before launch, books are shipped out to the stores. Marketing goes into high gear and everyone is working to make sure all the ducks are lined up. Your nerves will be pretty shot by now, but take deep breaths and you'll get through it. A few weeks weeks before launch, any online marketing will begin, and the final big push will start. Then the book launches and goes on sale. Marketing is still working to get coverage, book signings and events are scheduled, online opportunities are posted, and things start chugging along. And you'll start working on your next book. Anything else you'd like to know about this process? Cool I love hearing the inside scoop! I can't imagine how exciting it must be to see your Little Idea That Could in the form of a beautiful book! Sean, they're both awesome :) But you don't have to open that package if you don't want to. All you have to do is resist it for the weeks before launch. Eek! I know the experience will vary by the book and author, but I'm curious about the span of time for this entire process. What about further down the line? Keeping bookstores stocked is part of, I suppose, the marketing/supply department's job? I've heard some publishing houses are better at this than others. Do you as author get any rundown of which stores are selling most and are they being re-supplied with books etc? 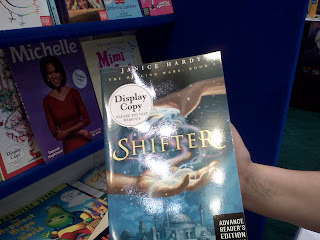 I ask also because I was in London a few weeks back and the Waterstones in Picadilly had only one copy of Shifter and that's it. Does the sales pitch just wind down and the publishing house stops supplying? I imagine the stores reorder when they sell out, if the book is selling well. I've heard that stores don't always reorder a sold-out book, because there are so many books and only so much shelf space. If another book by that author is coming out, I imagine there could be fresh orders of previous books. And sometimes that's when they do reorder a sold-out because there's a fresh marketing push. I'll see if my bookseller buddies will answer a few questions about this. I'm curious now myself how that side works. I only know the surface stuff and I bet a more in depth look would be very interesting.